"Amendment 4 to B.A.I. Order 211--Revised." 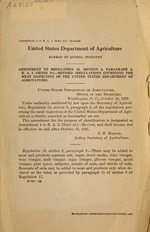 "Shall become and be effective on and after October 19, 1925." : r: :. .:: ..
":.r . '" *:'... .